It started off with NOTHING and now it’s my EVERYTHING! Yes, I know this sounds cheesy but I can do the rhyme! Oh Boy! So this was le BF’s idea to get a small place of our own after renting for the past 6 years. 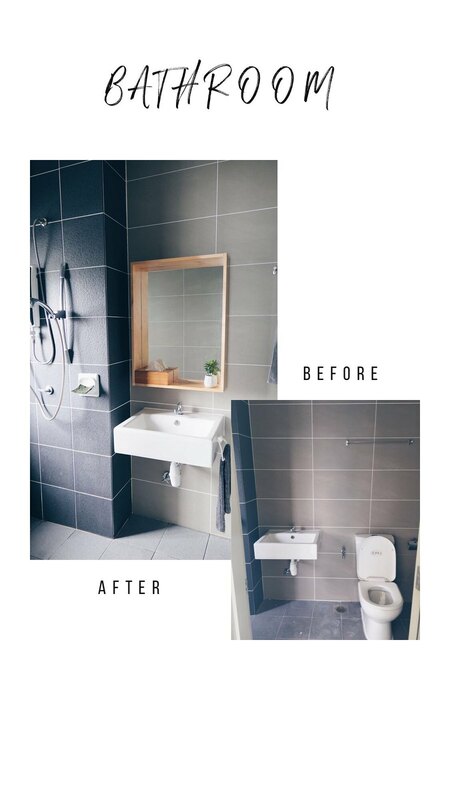 He thought it was time to get a nice place for running his business and also a cozy home and that was where we started our property hunting activity and after looking at just the second property, I would say we had minds that think alike and settled very quickly onto this second one. It took us about 3~4 months for loan and everything to get settled. 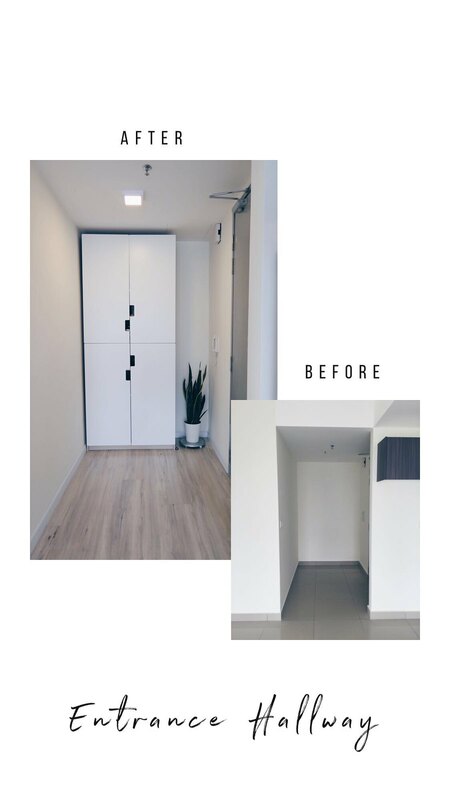 Another 9 months for the property to be fully completed and 3 months of handling of keys, spotting and fixing defects (which is one of our biggest challenges) which came to a total of 1 year before we could start with the renovation. The spotting and fixing defects is one of our worst nightmare ever as up till today defects in our unit are not completely done. Ughh!! How unlucky!! 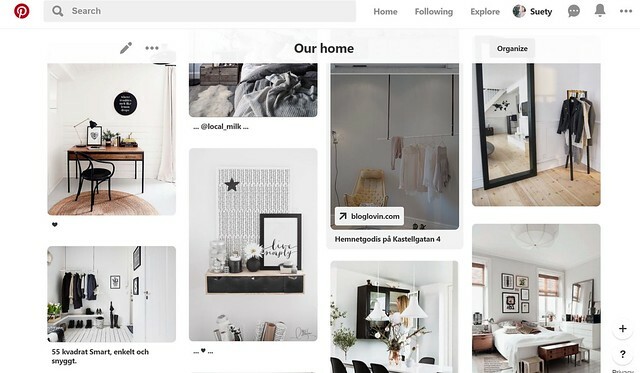 So getting back to the main topic, planning for this Little Home Studio wasn’t as easy as I thought but thanks to “Pinterest”, framing ideas for your home can now be so much more simpler and exciting! 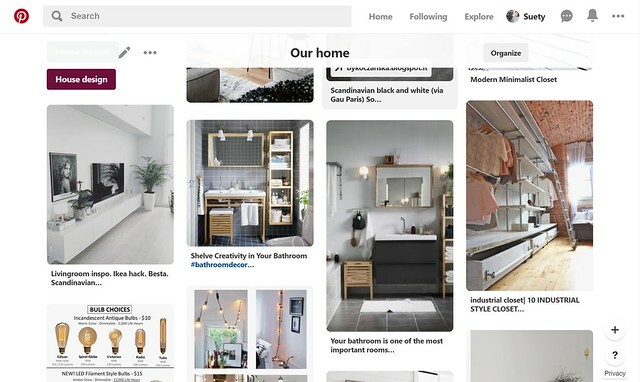 So what I did was to browse on all home ideas on Pinterest and pin all those that I like into a board. This process took me months before I ended up with my current design as I was being very indecisive. 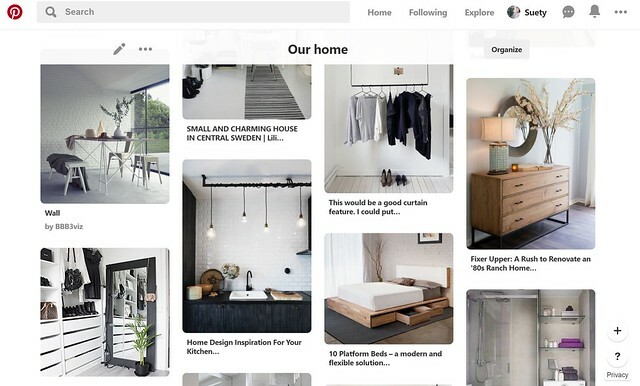 One minute Scandivanian style, the other minute industrial style and the next day modern style, then Muji style… then what?… Yes, this just went round and round… Never gonna stop not until you place your heart in one! 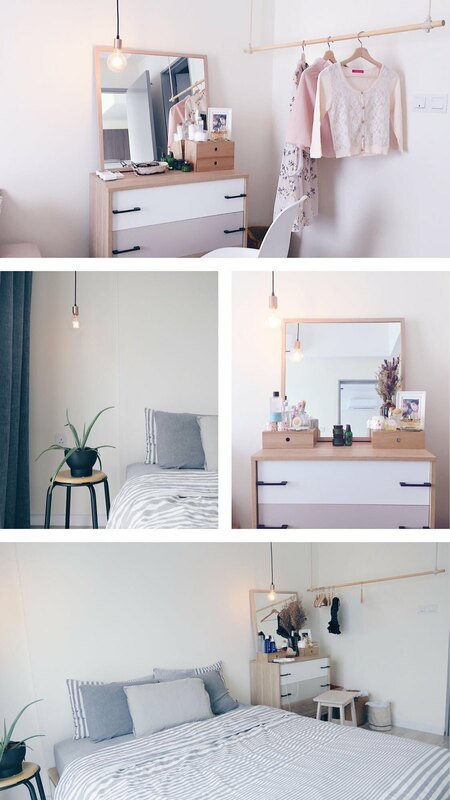 So, finally I ended up with Muji-like & Scandivanian style home design as I love wood elements and also white elements. That is where I combine both elements to create my own style. 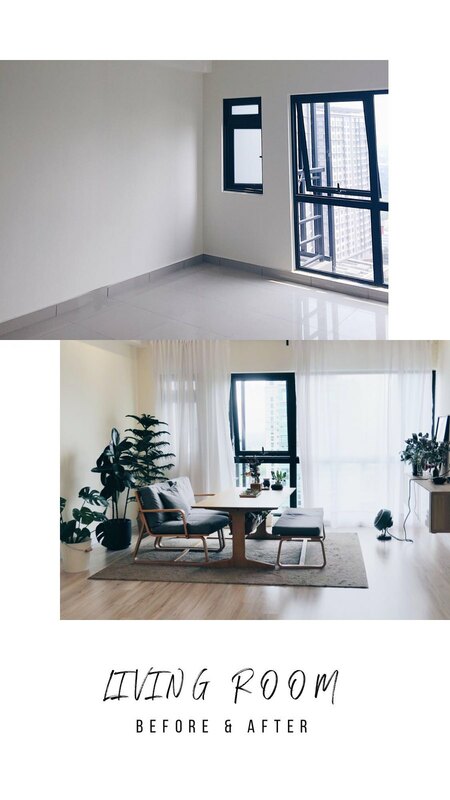 Keeping all furniture under the same soft tone and also trying our best to buy less cos we wanted a minimalist lifestyle too (sadly failed cos I had too many clothing and books, and le BF has too many plants). Basically, this Little Home Studio of ours comes in 2+1 R & 2 WC. So we categorized the rooms into Bedroom, Study Room and Closet Room+Store Room. 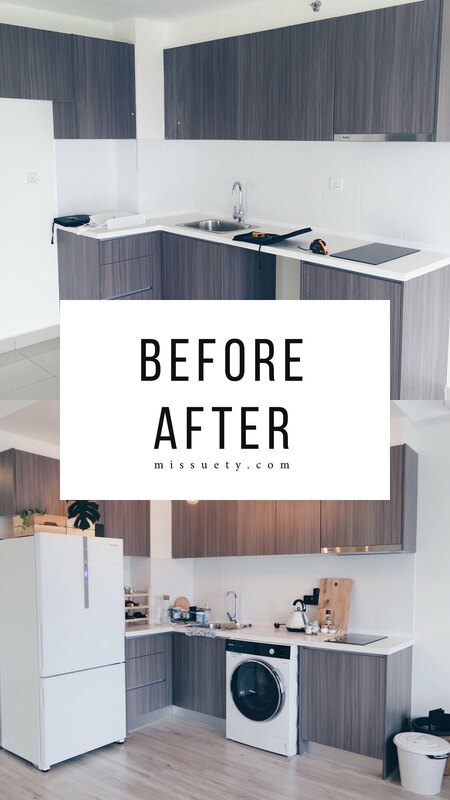 By the time we plan to have a baby, I guess we will be out of this home moving into a slightly bigger place OR we could just do another makeover. Moving back to topic, there weren’t many major renovations except for changing the floor tiles to laminated flooring by INOVAR. 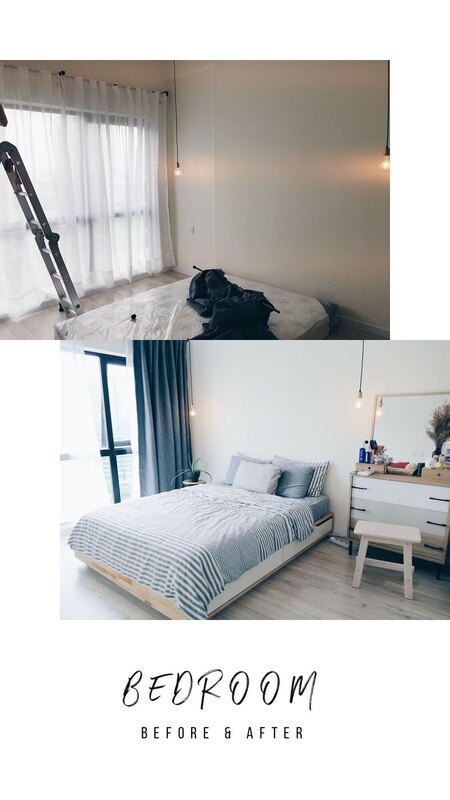 There were some DIY projects like the lighting in the kitchen area, living room and also in our bedroom are fully done by both of us. We got the materials from lighting shops and also TAOBAO. We even fixed the fans and the rest of the ceiling lights we bought from IKEA on our own. We also hand-picked the curtain material on our own from NAGOYA Textile and got my aunt to sew it for us. We also assembled all IKEA furniture, shelves and cabinets according to the manual one by one, carefully with 2 pairs of hands. The whole process wasn’t easy but at the end of the day seeing everything in place simply make you feel good instantly! The living room links with the kitchen and to refrain the space from being too compact, we opted to sacrifice the dining table in order to create a spacious living room. NO dining table but a “2 in 1″ MUJI Living Dining Set instead!! There’s even no sight of TV set in our living room cos we are very BUSY bees!! Just kidding! In fact we realized we don’t really watch TV ever since the invention of iPad (thanks to Apple Inc.). BANZAI! Small but spacious hallway is all we had in mind. 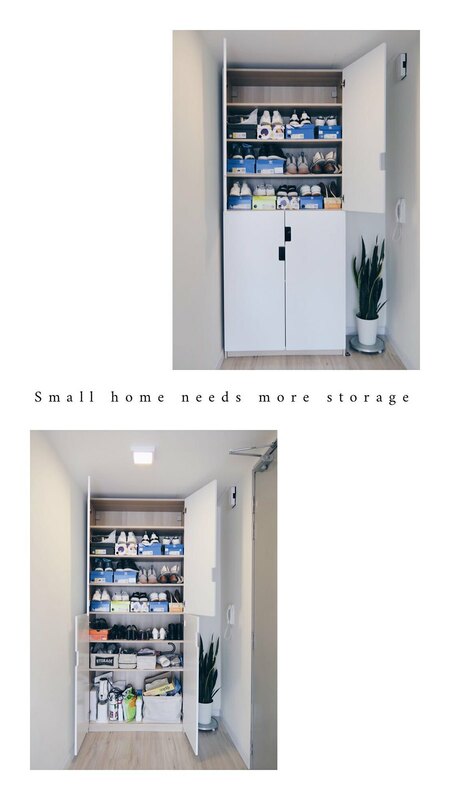 Small homes need lots of storage. Without much thought we got ourselves this IKEA cabinet to store our shoes, home appliances and some random items cos we know we will need lots of storage place. The most important place of all in the universe to keep you sleep soundly every night. So it have to be very cozy so you will want to snug in there all night. Again, it’s really small and I definitely cannot fit my whole closet in there so there’s only a Queen-sized bed, a small dressing table which was love at first sight and a ceiling clothes hanger which I adore the most when I first came through it on Pinterest and I have been having it pinned on my board before I even got a home of my own. Whoever came up with this idea is a freakin’ GENIUS! To help with ventilation and purifying, the life-saving Aloe Vera plant must be inside with us. Also, did I mention the TWO dangling light bulbs?! Oh! This one is my favourite too. Came across this idea on Pinterest and I know I definitely gotta put this up in my bedroom as it just bring about the whole ambiance of the bedroom. Grey and black is just the perfect color combination which comes originally in this home itself. This was also one of our main consideration when purchasing this property. We didn’t have to dump in any money to refurbish the bathroom as the tile designs are just perfect as it is. 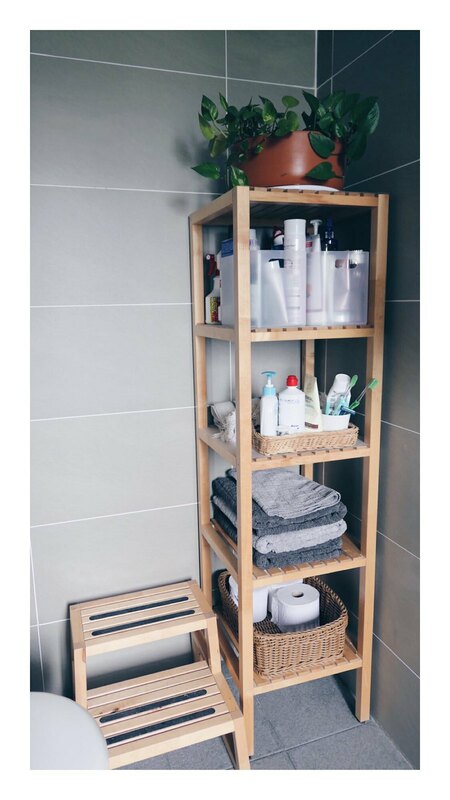 All we have to get is a mirror and a standing rack to hold our toiletries. The one and only space that gives no headache. 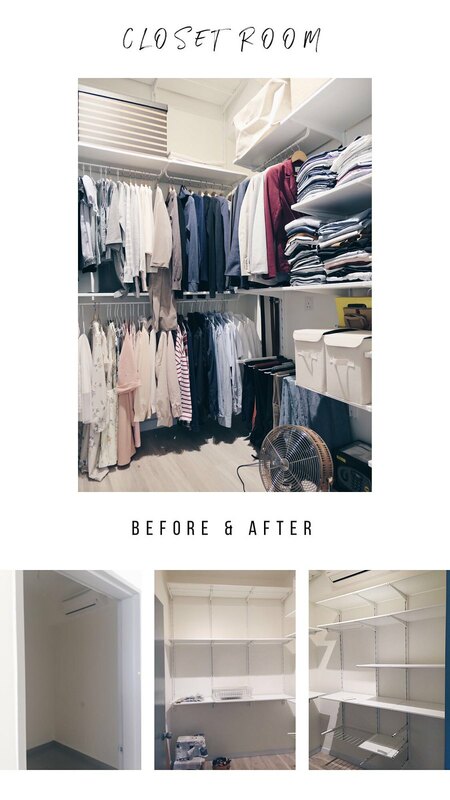 A place that needs to fit all of my clothing and ugly stuffs which needs to be hidden. 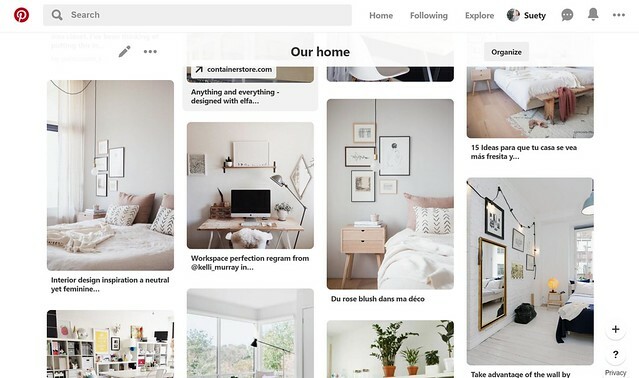 Building this ALGOT wall shelves from IKEA was something very challenging and unforgettable. We took the hassle to build it on our own from scratch and this was one of the most time consuming project of all. It took us few weekends to finish drilling and assembling. I will never ever want to go through this again cos it was really torturing. Somehow, at the end of the day it was really fulfilling. A room where all the readings and craft workings make wonders. Le BF might say NAH to this cos none of that happened here. This has been le BF’s personal gaming and planting space every night and weekends. The readings and the craft workings go to the Living Room instead. Anyways, the highlight of the Study Room is this IKEA Billy Oak Veneer Bookcase. I guess you can easily tell which side belongs to me and which side belongs to le BF. We actually had a small argument on the color of this bookcase as le BF wanted white and I strongly stood by Oak. I somehow managed to persuade him into picking Oak and I would say this is definitely not the wrong choice. 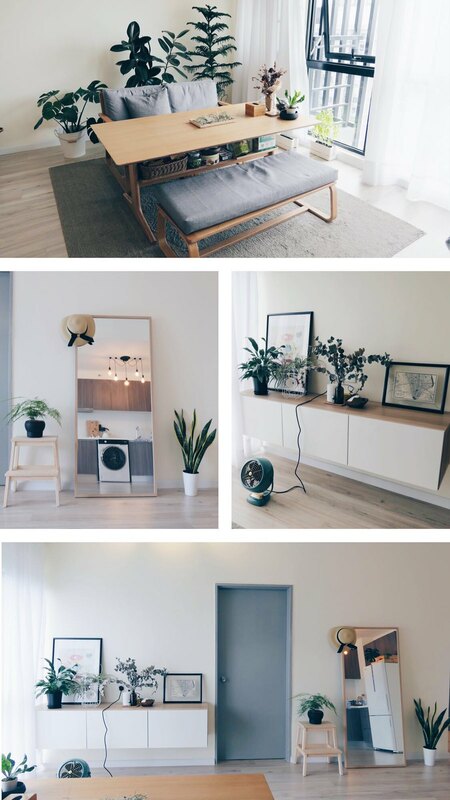 By the way, most of our furniture are from IKEA Malaysia and MUJI Malaysia. As for decorative items, they are from random places around the world – Japan, Korea, The States, Thailand. Just how enlightened are you after going through my Little Home Studio? I hope this inspires you to build your own dream home someday too! Thank you for reading and hope to see you again in my next post! Very nice home you have ! 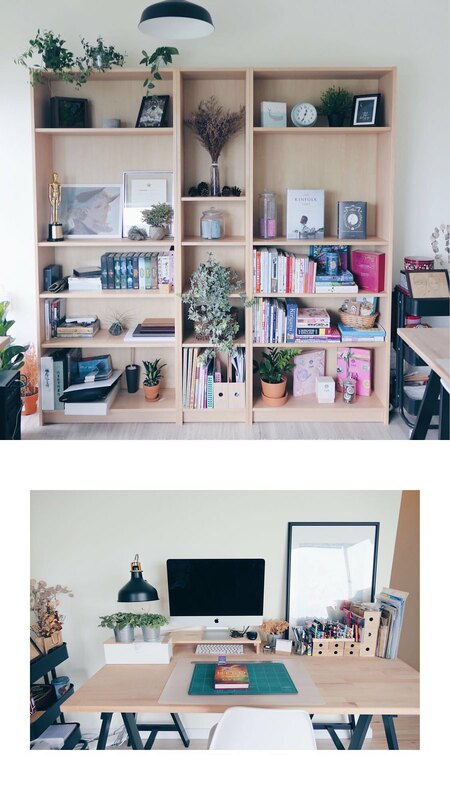 I like scandi / muji styles too !